In this issue of Everything Knoxville, we are excited to share with our readers this interview with CertaPro Painters of East Tennessee’s Jim Mazrimas (Residential Sales Associate), Salomon Velasquez (Job Site Supervisor), and Liz Kaleida (customer). 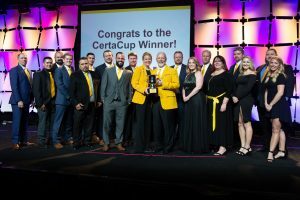 CertaPro Painters of East Tennessee is the proud recipient of numerous awards and honors for their expertise in the fields of both residential and commercial painting during the last 16 years, including 2018 National Franchise of the Year. They continue to earn a reputation for honesty, integrity, value, and quality craftsmanship. EK: How did you hear about CertaPro originally, and what motivated you to make the call for an estimate? EK: How do you make each estimate experience personal for your customers? EK: Describe the CertaPro Painters process and how this process differentiates from other contractors/home improvement specialists you’ve hired. EK: You advertise that you “don’t paint houses, you paint lives.” How does that look from a painter’s prospective? EK: Did CertaPro Painters deliver on the promises that were made during the estimate? EK: Poor communication is often cited as the number one complaint of both home and business owners when hiring a contractor. How do you communicate with your customers to overcome a challenge? EK: How did CertaPro handle any potential issues that came up during the job? EK: What makes CertaPro different than other companies you have worked with? EK: Tell our readers about the other services CertaPro Painters offers their customers. EK: How can our readers learn more about CertaPro Painters of East Tennessee?